Breaking Bad: "4 Days Out"
You know what would be a good slogan for a water company? "Water. Clearly." Can't take credit for that one — it's a Noel Murray original. But it came to mind as a good synopsis for this water-themed episode. "4 Days Out" is also one of those locked-room eps that BB stages from time to time: Krazy 8 In The Basement and Hostage In Tuco's Living Room are other examples. Almost everything stops while our heroes have to solve one pressing, life or death problem. The world stops, and survival is on the line. In the annals of those episodes, "4 Days Out" ranks right at the top. It's another brilliant example of how a crisis both illuminates our protagonists' characters — and changes them. Water flows from a tap in the medical center waiting room while Walter and the whole White support team wait for his PET-CT scan to find out his cancer responded to chemotherapy. Marie takes the opportunity to vent the usual nurses-know-just-as-much-as-doctors rant, and offers to read his scan for a lot less than his fancy doctor is going to charge. And even though Skylar gives a thin-lipped refusal, Walter can't resist asking the technician for his opinion after he gets out of the machine. What he sees in the reflection of the screen (on an glass-framed Outer Banks travel poster) makes him believe he knows the answer already: A big white mass sitting squarely in one lung = Not much time left to make the big bucks. Especially after new silent partner Saul Goodman informs him that he'll only net about $10,000 for every $16,000 he brings in, after distribution costs and Saul's 17% cut. 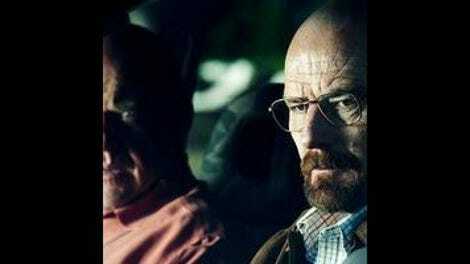 So Walter gets Jesse on board with a plan to maximize every moment. Step 1: Tell Skylar that Walter's mother needs to be visited to make sure the White clan is firmly ensconsed in her will. Step 2: Tell Jesse that the methlylamine in the barrel they stole is "losing its potency" so they need to make as much hay with it as they can before it goes bad. Step 3: Use the four days Skylar thinks he's at his mom's to cook cook cook cook cook. Jesse picks up Walter at the airport moments after Skylar drops him off (a promise having been awkwardly extracted from her that she won't call unless it's an emergency) in their rolling meth lab. Out to the desert they go in the first of two spirited montages, this one scored to Blue Mink's "Good Morning Freedom." After fifteen miles of dirt road, they park, get the generator going, and enter montage #2: cook, eat Funyuns (silhouetted against the sunset), cook, piss, cook. When their Rubbermaid container is full of gallon Ziplock bags filled with blue crystal, Walter does a few calculations and determines they've just made $672,000. Each. Even though he wants to keep going all the way until Skylar expects him back on Tuesday (using as much of the precious methlylamine as possible before it decomposes), Jesse convinces him that they should take a break when the generator runs out of gas. "There's gotta be a Denny's out there someplace. Grand Slam? Hot shower? Sleep in a bed?" he entices. But it's time for the episode to become a thriller. The 'Bago's battery is dead. And after the usual recriminations about whose fault it is, they siphon gas from the RV's tank to start the generator for a jump. When the generator explodes, Jesse douses the resulting fire with the rest of their drinking water. Now the only tool they have left to escape is Walter's cell phone (which we earlier established has a signal, while Jesse's does not). Walter's loath to use it lest Skylar see an unfamiliar number on the bill and start playing detective, but Jesse's homemade tinfoil antenna ain't cutting it. So they finally use Walter's phone to call Skinny Pete for a rescue. "Roaming drains the battery," Walter warns Jesse, a statement that proves prophetic when the phone dies during the second phone call — the one where Jesse discovers that Pete is driving down the wrong dirt road and will never find them. So now all our heroes have left are their wits. Plan #1: Disassemble the generator, attach a lug wrench to the coil, and take turns cranking it by hand for the entire day, hoping to impart enough charge to the camper battery to get it to turn over. And it almost works — but after sparking briefly, the engine dies. Poor Jesse collapses on the steering wheel, mumbling "Why couldn't I have just gone to Sante Fe?" Sante Fe, where a lifetime ago Jane was going to show him the paintings of Georgia O'Keefe, with the enticement of their vaginal subtext. You see, water's not the only recurring motif of this episode. There's also time: the spontaneous art museum junket with Jane, the stolen days of the mother-in-law deception, the weeks ticking away before Walter's cancer kills him. What you're doing now, and what you're putting off until later. Walter's ready to give up the ghost. Who cares, he was going to die anyway. But Jesse wants to live. "You need to cut all your loser crybaby crap and think of something scientific!" he yells at Walter, unconsciously echoing Skylar's urging him to stay positive. And one of his science words brings the light back to Walter's eyes — no, not robot nor dune buggy — battery. Galvanized metal in the form of washers and screws and coins to provide zinc for the anode. Mercuric oxide and graphite from the brake pads for the cathode. Potassium hydroxide soaking sponges for the electrolyte. "And what shall we use to conduct this beautiful current? What element comes to mind?" Walter asks, twirling a length of copper. "Oh, wire!" Jesse enthuses, apparently believing wire to be an element. So much for the impromptu chemistry lesson. This time Walter sits in the captain's chair. And after a little gentle patting of the 'Bago's dashboard — come on, science! — the engine roars to life. Science has bought them more time. Not just in the desert, but in Walter's body as well. His tumor has shrunk by eighty percent, says the doctor. That white blob on his scan? Inflammation from the radiation treatments. The blood Walter coughed up in the desert ("no more secrets," the doctor advises sternly when Skylar betrays that she hasn't been told)? A tear in his esophagus. Jesse and Walter bonded in the desert, but it was the bond of short timers. Both of them understand now what's driving Walter, and how far he'll go, and Jesse has a newfound respect for that — so much so that he swears he'll give Walter's share to his family after he's gone. But now Walter's gone from a death sentence to a life sentence. And judging by the dent in that towel dispenser, that's the one result for which he's not prepared. - "It is a full PET-CT right? You definitely want the CT and not just the PET." - Crunch Berries: The official cereal of meth cookers. - Out of dozens of terrific character moments in this episode, my favorite is Walter giving in to the excitement of the meth cooking accomplishment and high-fiving Jesse.